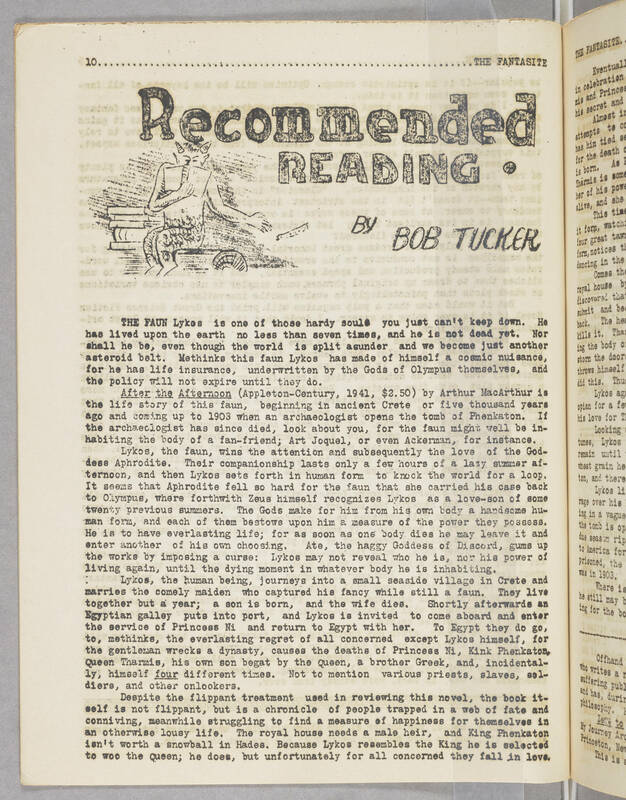 10...................................................THE FANTASITE Recommended READING BY BOB TUCKER THE FAUN Lykos is one of those hardy souls you just can't keep down. He has lived upon the earth no less than seven times, and he is not dead yet. Nor shall he be, even though the world is split asunder and we become just another asteroid belt. Methinks this faun Lykos has made of himself a cosmic nuisance, for he has life insurance, underwritten by the Gods of Olympus themselves, and the policy will not expire until they do. After the Afternoon (Appleton-Century, 1941, $2.50) by Arthur MacArthur is the life story of this faun, beginning in ancient Crete or five thousand years ago and coming up to 1903 when an archaeologist opens the tomb of Phenkaton. If the archaeologist has since died, look about you, for the faun might well be inhabiting the body of a fan-friend; Art Joquel, or even Ackerman, for instance. Lykos, the faun, wins the attention and subsequently the love of the Goddess Aphrodite. Their companionship lasts only a few hours of a lazy summer afternoon, and then Lykos sets forth in human form to knock the world for a loop. It seems that Aphrodite fell so hard for the faun that she carried his case back to Olympus, where forthwith Zeus himself recognizes Lykos as a love-son of some twenty previous summers. The Gods make for him from his own body a handsome human form, and each of them bestows upon him a measure of the power they possess. He is to have everlasting life; for as soon as one body dies he may leave it and enter another of his own choosing. Ate, the haggy Goddess of Discord, gums up the works by imposing a curse: Lykos may not reveal who he is, nor his power of living again, until the dying moment in whatever body he is inhabiting. Lykos, the human being, journeys into a small seaside village in Crete and marries the comely maiden who captured his fancy while still a faun. They live together but a year; a son is born, and the wife dies. Shortly afterwards an Egyptian galley puts into port, and Lykos is invited to come aboard and enter the service of Princess Ni and return to Egypt with her. To Egypt they do go, to, methinks, the everlasting regret of all concerned except Lykos himself, for the gentleman wrecks a dynasty, causes the deaths of Princess Ni, Kink Phenkaton, Queen Tharmis, his own son begat by the Queen, a brother Greek, and, incidentally, himself four different times. Not to mention various priests, slaves, soldiers, and other onlookers. Despite the flippant treatment used in reviewing this novel, the book itself is not flippant, but is a chronicle of people trapped in a web of fate and conniving, meanwhile struggling to find a measure of happiness for themselves in an otherwise lousy life. The royal house needs a male heir, and King Phenkaton isn't worth a snowball in Hades. Because Lykos resembles the King he is selected to woo the Queen; he does, but unfortunately for all concerned they fall in love.